OK, I’m guilty! Guilty of what, you may ask. Well, of feeding my dinner guests far too much and sending them home groaning that they are so full, they can barely walk! You see, I love to start a dinner party with a table full of enticing appetizers even before the main course is served! Heaven knows why I feel compelled to do this, but I probably learned it from my mom. If I really stop and think about it, it seems to be a feeding tradition that runs in my family! Here is one such appetizer that you may find on my overly laden appetizer table. It really is a meal in itself! The marriage of flavours in one bite is so close to perfection, you will have your guests swooning! 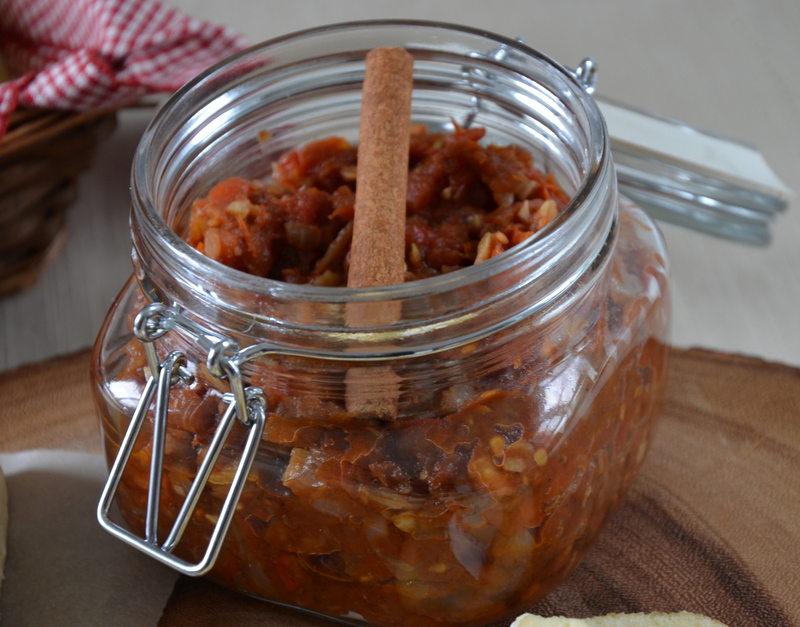 It would make a wonderful picnic lunch or light evening meal served up with a salad. It is from the award winning, mostly vegetarian, Canadian cookbook “Rebar: Modern Food Cookbook”, by Audrey Alsterberg and Wanda Urbanowicz. If you haven’t acquired this cookbook yet, I encourage you to do so. Every recipe I have cooked from it is scrumptious beyond words. Pre-heat oven to 325°. Place tomato halves on a baking tray, cut side up and brush lightly with oil. Sprinkle with salt and pepper and roast for 45 minutes. Cool. Cover the sundried tomatoes with boiling water and soak for 10 minutes. Drain and reserve the tomato water. Heat oil in a skillet over medium heat. Add onion and sauté for 5 minutes. Add minced garlic, ginger, cumin, chile flakes and cinnamon sticks. Sauté 5 minutes; remove from heat. Remove cinnamon sticks and allow to cool. Place roasted tomatoes, soaked tomatoes, onion mixture and all remaining ingredients into bowl of food processor. Pulse to combine while maintaining some nice texture. If too thick, thin out with some of the reserved tomato water. Season to taste with salt and pepper and let stand at least 30 minutes before serving. This tastes better the next day and can be stored in the refrigerator for up to 1 week. Pre-heat oven to 400°. 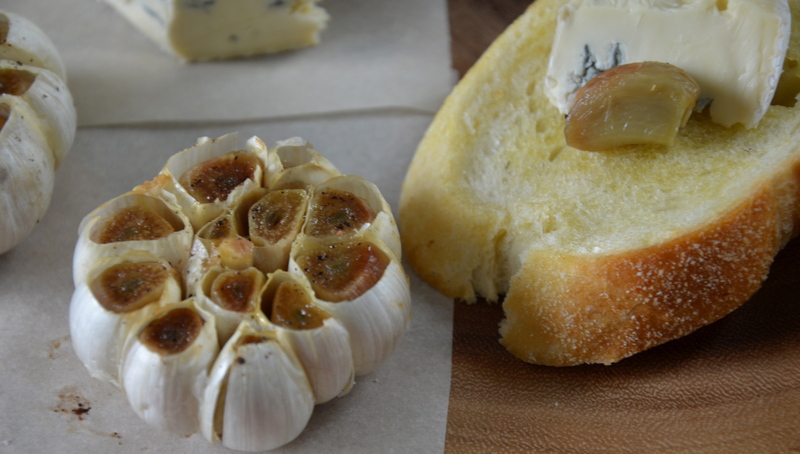 With a sharp knife, slice off the top of the garlic bulb to expose the tops of the garlic flesh. Place each bulb on a square of aluminum foil. Drizzle with olive oil and sprinkle with salt and pepper. Wrap up each bulb tightly and place in the oven. Bake for 45 – 60 minutes, depending on the size of the bulb. The flesh should be soft when you test them with a knife and be a lovely caramel colour. Preheat oven to 325°. Slice the baguette into 1/2 inch thick slices. Place on a baking tray and brush with the olive oil. Bake 5 to 10 minutes until golden. 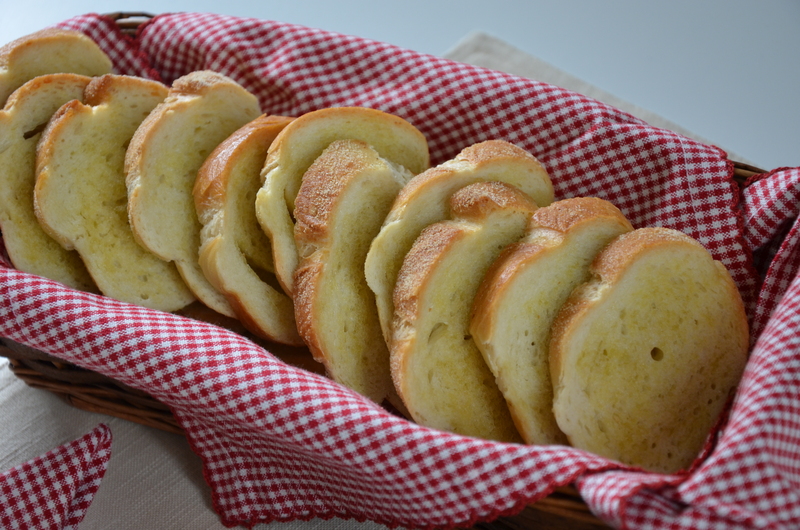 Cut garlic cloves in half and rub the cut side of the clove on the roasted bread. Place in a cloth-lined basket. Place the garlic and cheese on a platter. 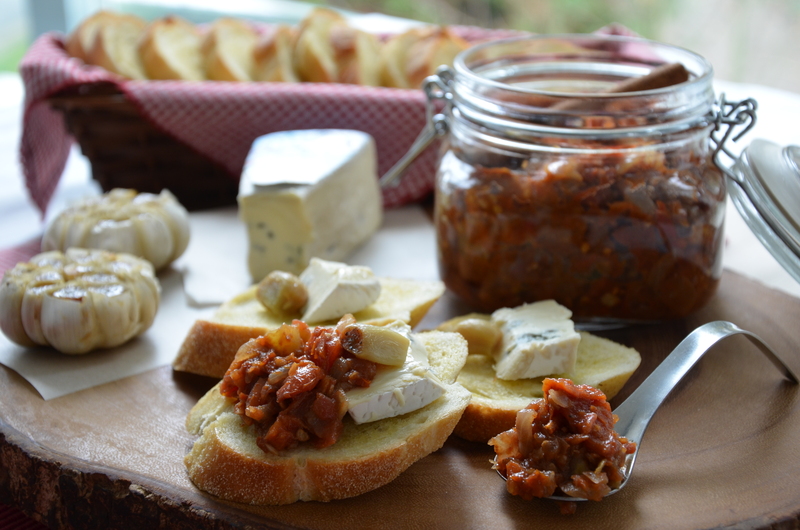 Place the tomato-ginger chutney in a serving bowl and the garlic crostini in a cloth-lined basket. 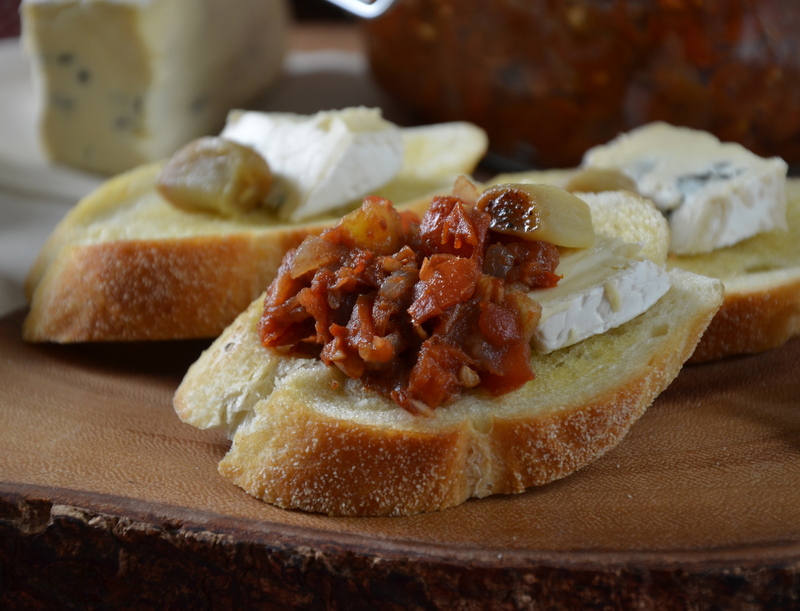 To eat, simply spread a clove of garlic on a crostini, top with a slice of cheese and a dollop of chutney. Devour with gusto! Well, thanks so much! I just found you blog today and was really impressed with it! I love the idea that all of your recipes contain superfoods. I am also very much looking forward to following you and trying out some of your lovely, super healthy dishes!